The Hormann Aluminium Entrance Doors are precision engineered top quality front doors for your home which can be customised in any way possible to suit your personal tastes. When only the best will do these are the entrance doors to look at. The Hormann range of aluminium entrance doors are available in 4 different high quality versions - TopComfort, ThermoCarbon, ThermoSafe and Thermo65. Each version varies in appearance, levels of security, thermal insulation values and more all depending on individual requirements. The TopComfort models offer a basic specification (by German standards!) but also some unique features when applicable to an installation. All entrance doors are made to measure to your exact structural opening size. There are no standard size entrance doors sitting on the shelves waiting to be picked, you specify to order. The sizes of these doors always refer to the overall door and frame size for ordering purposes, the doors always have a precisely fitted aluminium sub fixing frame fitted from the factory with a bottom threshold with the very lowest possible height for the cleanest, trip free access. Any RAL colour is available to choose from on most door models. The exterior can be different to any combination of colours inside and out for the door panel AND frame giving you additional creative freedom. There is always a choice of glazing options on all glazed door styles with extensive options in the type of actual glass used including triple glazing. There is an extensively wide range of handle options for inside and out on all models. These door handles rance from long, vertical steel bar handles to the traditional British horizontal door handle. Higher levels of security locking as standard over most other entrance doors available and the locking is integrated into the door panel during construction and is not an add on after panel construction. Very low threshold for ease of access as standard with double weather seal built in. Concealed hinges as standard on the Prestige PLUS offering very smooth, easy operation. Precision engineered components ensure a super tight seal around all sides giving top levels of insulation. Huge range of top transoms and side elements all made to order with glazing options. To summarise, the range of aluminium entrance doors are made exclusively for your unique order. Whether you are an architect, designer or homeowner, a Hormann Aluminium front entrance door for the home. The first thing people seek when selecting a new entrance door is the security it offers. When it comes to security, you can trust the high quality of Hörmann entrance doors – the H-5-Automatic special security pivoting bolt lock incorporated as standard provides your home with quality-tested protection. When locking, 3 steel bolts with 2 additional hooks pivot into the stainless steel lock plates. Included in this, a stainless steel bolt on the hinge side engages with the fascia frame. This way, you can feel thoroughly secure with the compelling 6-point locking system. Hörmann provides you with several excellent security packages offering graduated further increased security and comfort. For all Comfort versions you can continue to unlock your entrance door with its key. S-5 Comfort Scan opens your door with a finger scanner. You and your family no longer require keys. You can also operate your Hörmann garage door with this technology. The S-5 Comfort security packages feature an automatic lock that locks the door securely when closed. This makes it impenetrable to burglars. When opening via one of the control element options (internal push button, hand transmitter, etc.) a built-in motor releases the lock and the door can be effortlessly opened. Of course, you can still continue to unlock your entrance door with its key. With S-5 Comfort, your entrance door can be opened at the push of a button from the interior e.g. via the house intercom. This is especially suited for multi-party residences. The S-3 S security package includes a steel bar integrated into the lock. This allows you to initially open the door only a crack, preventing strangers from pushing it open all the way. This security package is also available with an automated lock. (S-5 S Automatik) which automatically locks your entrance door when it is pulled shut. The automatic lock is also available without a steel bar (S-5 Automatik). 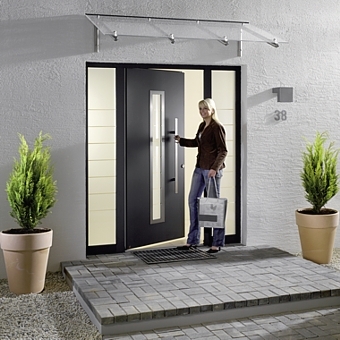 Hormann Entrance Doors are divided into 4 categories in the range of aluminium doors. Offering thermal insulation, acoustic (sound) insulation, watertight flexible seals around the edges and a range of over 70 different door designs, no taste is left uncatered for.